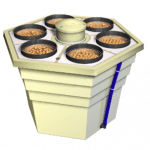 If you want to grow trees the Powergrower 8 Pack is the system for you. This is a WaterFarm on steroids. 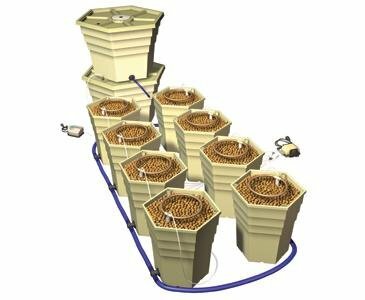 It features an aerated top feed drip system and a deep water culture system for plants as they get larger. The reservoir provides room for plenty of nutrient solution which is recirculated through the 8 growing modules. 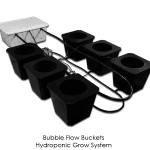 PowerGrower 8 Pack For Trees Can You Handle It? This is a recirculating deep water culture hybrid at its best. There are drip loops to water plants when they are small. The plants grow through the hydroton and into the reservoir. All the time they are being aerated from the top and bottom. The double reservoir is easy to fill and they are 17 gallons each. The top reservoir is connected to a float valve in the lower reservoir. There are 8 5.7 gallon hex reservoirs with 3 gallon growing chambers that have a lay out that can be adjusted for different plant sizes and room sizes.